Sculptures were created in Ancient Greece mainly for religious purposes. In this way, gods slowly came to life and people believed it was a means to gain their blessing. The first sculptures in Ancient Greece were created around 3000 BC, but they were up to 15 centimeters high and not elaborate at all. They mostly depicted women and were made of clay or marble. The Greeks were also inspired by Egyptian sculptures, which mostly depicted a standing man with one foot at the front, as well as a sitting priest. During the 7th century BC, the first Greek statues were created, using limestone and later marble. 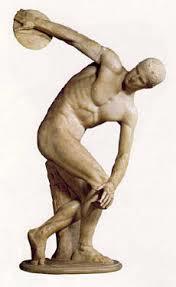 Throughout the Archaic Era, sculptors created standing Kouroi and Korae (male and female statues), whose bodies, initially, were not perfectly scaled; studying the body of athletes, though, sculptors soon understood the secrets of human anatomy and the temples of Ancient Greece filled with statues small and large. The male body was depicted naked, while the female forms were covered in the simple, Doric, or elaborate, Ionic tunic. In the 6th century BC, two sculptors from Samos made a breakthrough and managed to create bronze cast statues, by pouring liquid bronze in previously sculpted molds. After the Persian Wars, the statues started having different, more natural and balanced postures and no longer smiled; their expressions became much more austere and focused, full of power and flaming gaze. In 450 BC, sculpting reached its peak and all statues were now characterized of unsurpassed finesse, serenity and meditation. Feidias, Myron and Polycletus are some of the most important sculptors of this period. They were later followed by the great sculptor Skopas from Paros, who managed to express pain and sorrow in his creations, and Praxiteles with his full of sweetness, lust and meditation gods. The Hellenistic Era spread Greek art out of the Greek borders and fine examples now appeared in other places rather than Athens. After the Roman conquest, the Greek sculpture greatly influenced Romans, but was lost with the prevalence of Christianity in the Byzantine Empire, because the Orthodox Church banned the sculptural depiction of saints.